Great changes took place in the marshes from 1250 onwards, but as yet the town of old Winchelsea was apparently not threatened. Matthew Paris, the thirteenth century chronicler, described damage done by the sea in 1250 and 1252 to the neighbourhood of the port, but the town as such appears to have escaped harm. In 1280 it is recorded that the major part of the town had been submerged by the sea, while a document of 1283 shows that it was threatened with total submersion. About 1290 the site was finally abandoned for New Winchelsea. Where was old Winchelsea? This is a question more easily posed than answered. Its position was apparently first shown on Symonson’s map of 1594, but this may well be inaccurate, especially as later maps indicate different sites. Modem research tends to place it to the South and East of Rye. No trace of it remains, but this is hardly surprising. During its gradual destruction and evacuation, stone and other building materials of any value would have been removed and no doubt most of the buildings were constructed of wood. In any case, much of the site is now probably covered with sand, soil and gravel, while some of it has been washed away altogether. 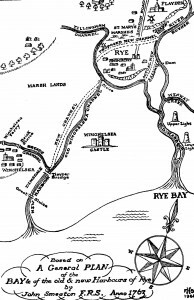 The course of the River Rother, which originally emptied its waters at New Romney, changed during the thirteenth century. It is probable that the new estuary of the Rother and Brede, which eventually replaced the port of Winchelsea and followed more or less the present channel, did not become navigable until the end of the fifteenth century. Not long thereafter the old port of Winchelsea silted up so as to become too shallow for navigation and was. finally abandoned in the first half of the sixteenth century. The new estuary gave Rye a decided advantage, as shipping to it would no longer have to pass the Camber, which was controlled by Winchelsea. That the initiative had passed from Winchelsea is evidenced by the increased commercial activity of Rye at this time, as is shown by the improvements made to the docks and quays at the Strand in 1480 and succeeding years. Hardly had Rye acquired a first-class haven, when it began to be assailed by troubles of its own. Two factors were mainly responsible for the ills of the harbour from this time on. The first concerns the eastward drift of the shingle across the mouth of the harbour, and the second was the continuous inning or enclosing of the salt marshes along the rivers. The innings constricted the channels of the rivers, reduced their scour and led to their gradual siltation. In spite of the expansion of the town in Tudor times, the number of ships using the port dwindled considerably. Despite the damage done by the innings they continued almost uninterrupted. By 1500 East Guldeford had been enclosed and by 1554 enough land had drained to damage the harbour of the Camber. Complaints made by the maritime interests of the town did move the Commissioners of Sewers to take strong action on one occasion—at least on paper. Those who had inned marsh, built dams and sluices were ordered in 1597 to throw down the enclosures and destroy the dams and sluices forthwith. That nothing was done is not surprising, as several of the offenders, who included the Mayor of Rye, were numbered among the Commissioners themselves! Many small and large schemes were put forward for the improvement of the harbour from the late sixteenth century until the end of the last century, none of which did anything more than delay its inevitable decline through natural causes. An excellent scheme was mooted in 1548 in which an elaborate system of sluices was designed to preserve the scour of the waters and thereby allay the decline of the haven. Unfortunately nothing came of it. Much more ambitious scheme was that devised by the Italian Gienily in 1591, which involved making a cut to the West of the mouth of the Rother and diverting the whole of the water to flow out at Dimsdale Bridge. 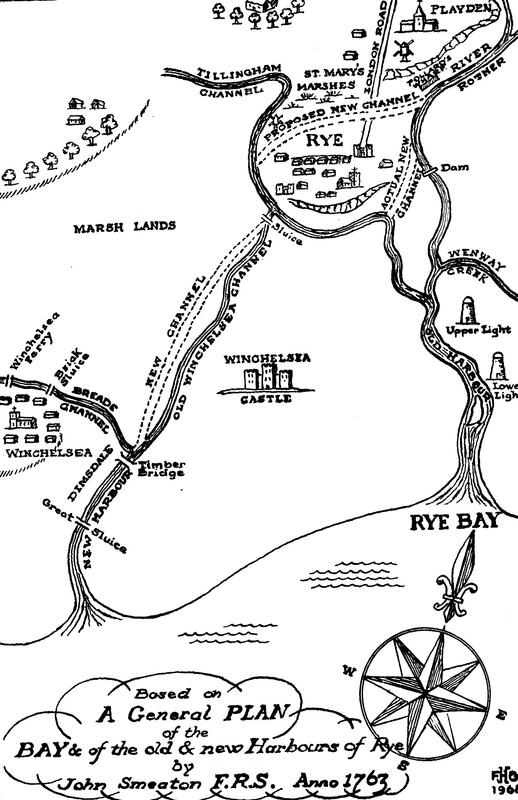 The Corporation were most enthusiastic until, as L. A. Vidler points out, they discovered that the river was to be diverted too close to their rival, Winchelsea. But the Corporation’s attitude was not the only factor that condemned the scheme, for it would have been too costly and probably would not have achieved the desired result. This was the most ambitious project before “Smeatons” harbour in the eighteenth century. 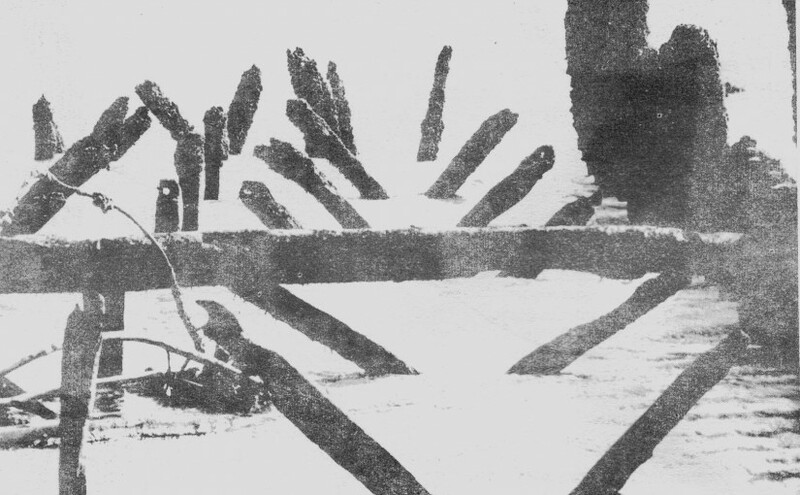 The harbour continued to deteriorate: innumerable sluices, dams and groynes were built in the creeks and channels of the Rother, Brede and Tillingham. In 1665 the harbour still possessed two separate entrance channels, facing south-eastwards and south.westwards respectively, but by 1677 only one channel remained and the greatest low-water depth in the harbour had been reduced to three fathoms, a fact well illustrated by Greenville Collins’s map of 1682. The opinion of the Admiralty Surveyors of 1698 was hardly hopeful. “We take it,” they reported. “to be in no case proper for a safe harbour to be resorted to, nor capable to be improved by any tolerable charge, for any services of the Navy.” All subsequent observers testified to its continuing deterioration until in the 1720s hope was abandoned and an entirely new outlet was planned. The plan put forward in the eighteenth century was devised by one Captain Perry. (It is frequently referred to as “Smeaton’s Harbour”, but this is a misnomer as Smeaton had not been born when the plan was conceived. 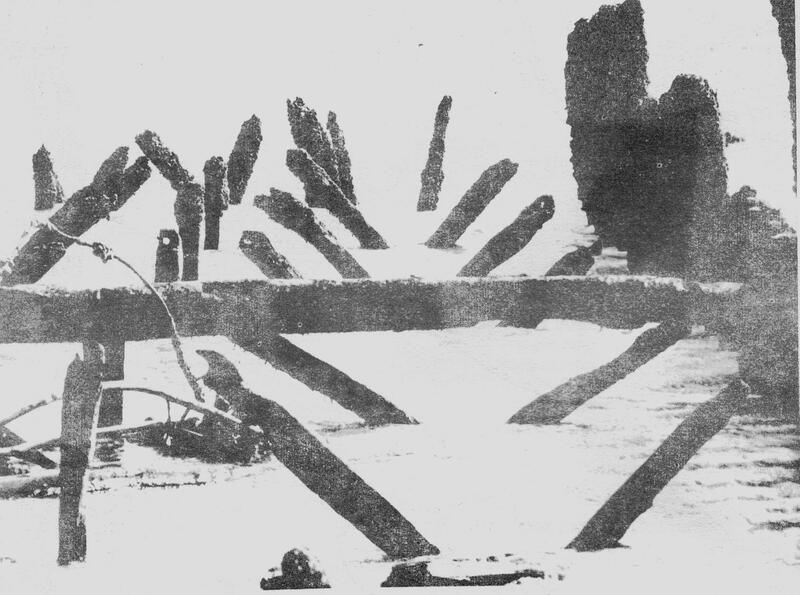 It provided for a new harbour about 200 feet wide, between stone piers projecting 120 feet into the sea, extending about one-third of a mile inland, where the water was to be controlled by a navigable sluice leading into a canal (about a half a mile in length) connecting with the River Brede at the point where that river turns north after passing Winchelsea (see map). The waters of the Tillingham were to be diverted into the Brede south-west of Rye, and the waters of the Rother into the Tillingham either by way of St. Mary’s Marshes (north of Rye) or by what is now known as rock channel. In 1723 provision was obtained for the new harbour and canal in an “Act for making more effectual an Act ……. for restoring the harbour of Rye to its ancient goodness”. These statutes set up inter alia. a Board of Commissioners to carry out the necessary work with similar powers to those of the Commissioners of Sewers. Construction proceeded by fits and starts and many alterations were made from time to time to the original plan. Smeaton’s name does not appear until the report of 1763, according to which the new harbour was opened in 1762 as far as Winchelsea wall, but not as yet to shipping. It was not apparently until 1787 that the whole of the new channel from the sea to Rye was opened for traffic. Complaints were soon made of the bad sewage of the marsh lands, as well as of the deterioration of the harbour. “The landowners,” writes John Meryon. “thinking that their lands were never likely to be so well drained as by the old harbour, soon came to a determination to abandon the new harbour and the inhabitants of the town, seeing no probability that the new harbour ever would be made as good as the old one, were not displeased at hearing of their intentions.” The new harbour was promptly abandoned and the old harbour re-opened. After a brief existence of not more than three months, the outcome of over sixty years work and the expenditure of some £300,000 was destroyed by the opening of an old channel from the Fishmarket to Holm­bush, thereby allowing the waters of the three rivers to reach the sea by much the same course as they do today. In the meantime no work had been done on the old harbour and only the smallest vessels were able to make the passage during this period. Fresh innings and the erection of sluice gates helped to destroy the natural scour. Even though much has been carried out at the harbour’s mouth and on the rivers themselves since the report of the 1839 Commission, that year in fact marked the end of attempts to retain Rye as a port of any consequence. One may well hold the landowners, who inned so much marsh land and dominated the boards of the Commissioners of Sewers and of the Commissioners set up under the Act of 1723 for making the new harbour, as primarily responsible for the ultimate destruction of the harbour, but this is only half the story. Nature herself had condemned the haven long ago: man merely hastened or retarded its slow, but inevitable, decay. The writer would like to express his great debt of gratitude to Mr. F. H. Gloyne, of Brent-wood, Essex, who gave so willingly of his spare time so as to produce the detailed map that accompanies and illustrates this article.